New Armenian Prime Minister Nikol Pashinyan used his first day in power on Wednesday (9 May) to call for deeper relations with both the European Union and Russia, but he also insisted that the public support that swept him to his new job will help build a majority government. Speaking to Armenian and international reporters during his first day as prime minister, Pashinyan said he hoped that EU countries would implement the existing agreement with the Caucasus republic and move onto talks on visa liberalisation “soon”. 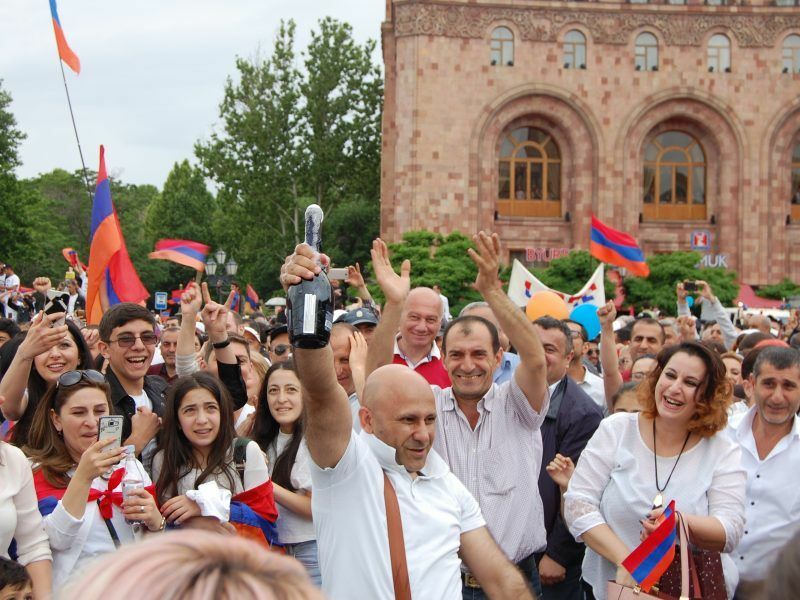 Pashinyan, who was appointed the head of an interim government on Tuesday (8 May), after almost a month of mass public protests, said that Armenians “deserved” to travel freely within Europe, a perk already enjoyed by neighbour Georgia. Armenia-EU relations are now governed by an agreement (CEPA) brokered in early 2017. But a more ambitious deal including free trade options was scuppered in 2014, when Armenia joined the Russia-helmed Eurasian Union. Yerevan has already ratified the partnership but most EU member states are yet to do so. Pashinyan hopes to see “tangible results” in that regard soon though. Russian President Vladimir Putin was the first world leader to congratulate Pashinyan in a phone call and the interim leader revealed they had a “sincere conversation”. He added that talks with Putin would continue on 15 May in Sochi, during a CSTO (Collective Security Treaty Organisation) summit, and that he only expected “positive developments” with Moscow in the future. Pashinyan also later spoke to EU foreign affairs chief Federica Mogherini, who congratulated the new leader and invited him to come to Brussels. Asked by EURACTIV about US President Donald Trump’s decision to abandon the Iran nuclear deal, a country with which Armenia shares a border, Pashinyan acknowledged he was worried but insisted that any disputes would have to be solved around the negotiating table. 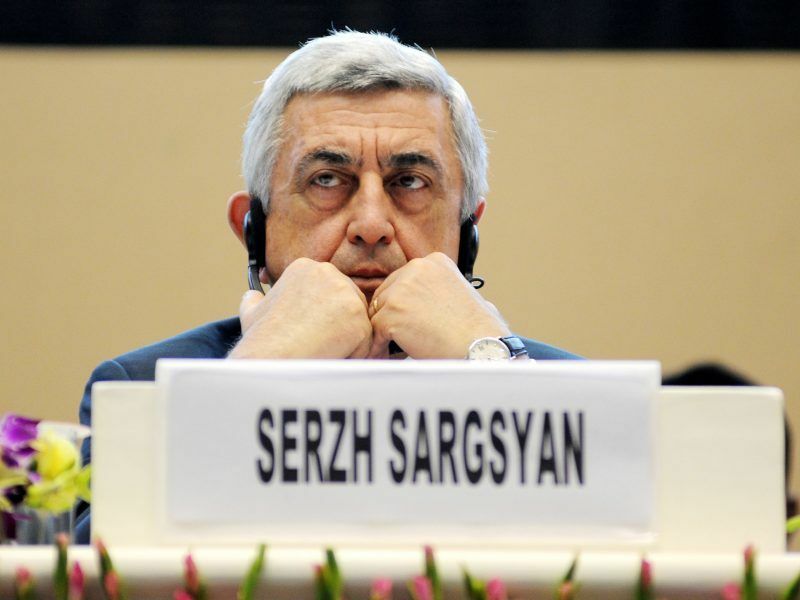 Former President Serzh Sargsyan backed the deal and European nations, particularly France, Germany and the United Kingdom are facing a race against time to convince Tehran that they and their partners can carry the agreement alone. EU Climate Commissioner Miguel Arias Cañete will visit Iran next week to make Europe’s case to preserve a complex agreement that is as much about trade and energy as it is about nuclear weapons. Armenia: Beginning of a former-Soviet bloc spring? Armenia’s so-called ‘love and solidarity’ revolution largely came about because citizens were concerned that political reforms designed by now-ousted Prime minister Sargsyan were putting the country on an authoritarian path. Though protests of a similar nature have flared up in countries like Ukraine, as well as EU members Hungary and Poland, Pashinyan insisted that it would be “impossible” to draw parallels with any other country due to the uniqueness of the factors at play, including geographical locations. He did reiterate that the revolution had been carried out without any violence and cited the fact that Sargsyan, who had been president for a decade, was still in Armenia and that a “peaceful atmosphere” is prevailing. The former journalist-turned-premier wasted no time in leaving Armenia himself though, using his first day in the job to visit the disputed territory of Nagorno-Karabakh, a region over which Armenia and Azerbaijan have waged two deadly conflicts in recent history. Nagorno-Karabakh, which self-styles itself as the Republic of Artsakh, wants the international community to recognise its independence but peace talks have proved fruitless, especially after April 2016 when conflict broke out for four days between the two countries. Pashinyan was keen to emphasise that his concerns are the internal matters of Armenia and that Nagorno-Karabakh’s government and president are responsible for themselves. However, he did reiterate his hopes that the disputed region would be granted a place at the negotiating table again. It is widely accepted that Nagorno-Karabakh would eventually seek unification with Armenia if it ever secured full recognition but the new prime minister insisted that any such decision would be made by the “people of the two republics”. In a swipe at his predecessors, who often used the early part of their mandate to visit wealthier countries like Russia, Pashinyan pointed out that he had decided to visit Nagorno-Karabakh, a relatively poor part of the world. 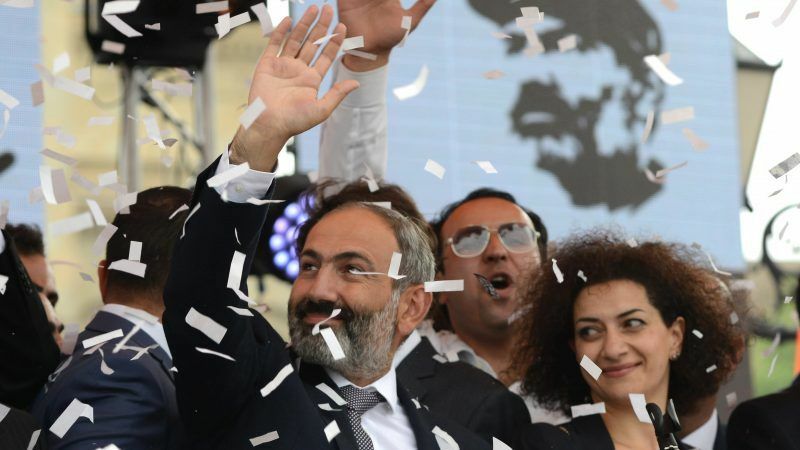 Pashinyan failed in his first attempt to convince the Armenian parliament to support his candidacy but that all changed on Tuesday, when 59 of the 105-strong chamber voted in favour. He has pledged to trigger new elections within two to three months and told reporters that the “much needed” ballot would be called in accordance with the constitution of the country. Asked by reporters how he would put together a majority government, Pashinyan simply said that a majority backed his candidacy for the interim prime minister and that a fresh popular vote would yield similar results. 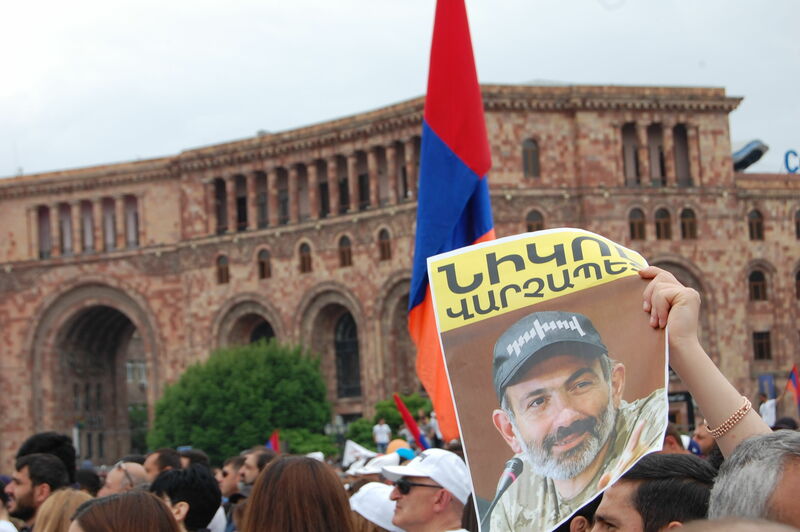 A popular figure, already infamous in Armenia for donning a khaki T-shirt and baseball cap during the revolution, Pashinyan is an outspoken critic of monopolies that hurt imports and oligarchs. Although still cagey on who will be picked to serve in his new government, Pashinyan is adamant that no oligarchs will get the nod and is even hopeful that more women could be included in his team.